When Michele Powles and family bought a section with beautiful forest views to build on, they knew they would face some challenges. ColorCote provided a roofing and cladding option that met the family’s own personal criteria, as well as environmental ones. Durability, easy maintenance and value were top of mind when considering their roofing and cladding options, but due to the site’s proximity to mangroves and subjection to sea spray, corrosion resistance was a high priority too. Considering the environmental complexities of their location, the family chose ColorCote’s MagnaFlow for their roofing. MagnaFlow provided extra anti-corrosive protection and far greater durability in a marine environment, and the cost was only marginally more than ZinaCore, ColorCote’s basic roofing option. Roofing and cladding materials were colour matched in black, providing a beautiful juxtaposition of modern accents against stained cedar, and connecting the home to its wooded surroundings. 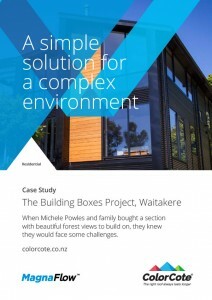 Environmental sensibility was equally as important in the Building Boxes project, as the family may mount solar panels and collect rainwater runoff at a later stage, and she was reassured to know ColorCote products are produced using ecologically sound water-based technology. Now that the structure has been completed, they can sit back and enjoy their home, where they can “soak in the quiet thrill of hearing nothing but birdsong”.